This is a short but interesting six-page manga about the story of the development of the「MSX」standardized personal computer. It stars BILL GATES (who doesn't need introduction) and the former MICROSOFT JAPAN Vice-President and ASCII CEO KAZUHIKU NISHI (西 和彦) who conceived the MSX computer. Although the manga is in Japanese, you should be able to understand it by reading the MSX article on WIKIPEDIA. Actually this manga is surprisingly a near perfect illustration of that article, so you will also enjoy reading the article more by looking at the manga. 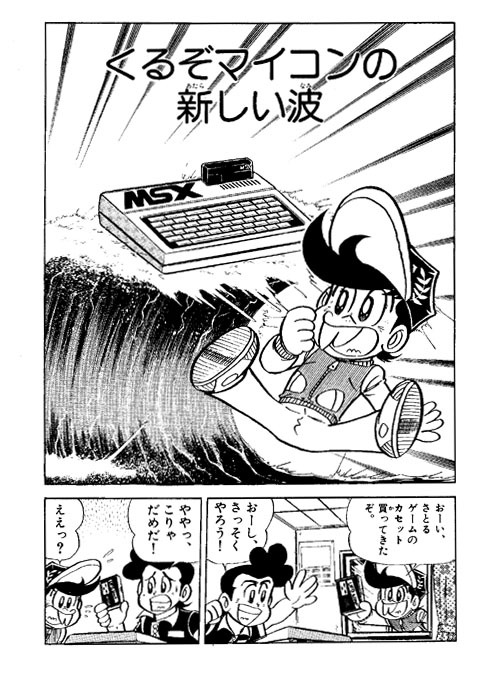 This「ARASHI MYCOM ENCYCOPLEDIA」manga was originally released on the October 1983 issue of the「COROCORO COMIC」magazine (1983 was also the year the MSX was released by the way).